DID WALT REALLY SAY THAT? Now you'll know for sure, in this comprehensive collection of Walt Disney's wisdom, as delivered through interviews, articles, speeches, TV appearances, and more. Each of the over 800 quotes in this book is authoritatively sourced as well. You'll be surprised by what Walt said—and what he didn't say! 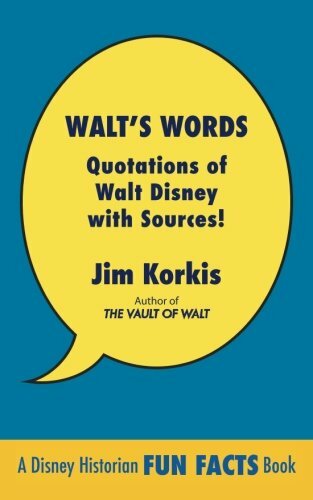 Disney historian Jim Korkis has devoted a lifetime of research into assembling the most complete, most accurate, most useful compilation of Walt Disney's quotes ever put into print. For fans, it's a deep dive into the wisdom of Walt; for authors and researchers, it's an invaluable reference, as Korkis also provides the source of each quote—something you won't find anywhere else. Walt Disney had a lot to say, about many different topics, including America, animation and films, art and music, books, business, Disneyland, education, fear and failure, Mickey Mouse, money and work, religion, storytelling, television, and women. It's all here, uncensored and unedited. The best way to learn about Walt Disney is to read what he said, not what others have said about him. Walt's Words is the closest we'll ever get to an autobiography of Walt Disney.